New for 2018, Oase Germany have released a powerful family of pumps which are extremely energy efficient but also deliver a considerable punch in the way of fountain or water feature display performance. The highly innovative Aquarius Expert Eco Pumps have superseded the workhorse Aquarius Universal 21000-40000 pumps to deliver similar performance but with greatly reduced energy consumption figures. The brand new range of Aquarius Eco Expert 22000, 28000, 36000 and 44000 also feature next generation smart technology, allowing the pumps to be connected to the OASE WLAN EGC controller for adjustment of the pumped water output flow, in addition to on/off control, timer functions and pre-programmed ‘dancing’ water displays, all via your smartphone or tablet. Up to 10 pumps can be daisy-chained together and individually controlled via the smart app. Aside from the new control options, the Aquarius Eco Experts really excel on the energy consumption front compared to their predecessors and against virtually all other equivalent pumps on the marketplace today. When you consider these pumps all carry a 5 Year OASE warranty and if we loosely assume a power consumption figure of £1 per watt, per year (i.e. 24 hour operation year round), the larger ECO 44000 pump would consume £1500 less in power than its Universal 40000 predecessor over the 5 year guarantee period. Furthermore, if the Aquarius Eco Expert pumps are coupled to the Eco Expert Control, EGC Control Cloud or WLAN EGC Controller, any adjustments made to the water flow rate will electronically reduce the power consumption, offering further energy savings. Water Garden Ltd can offer a multitude of Fountain Nozzle Attachments, spray bars and spray rings for use in conjunction with the Aquarius Expert Eco pumps to provide considerable decorative water displays in pond and lakes. The dancing modes add a dynamic entity to the fountain displays to provide that wow-factor without the previous complexity of DMX controls and programming. Warm White, Cold White or RGB Colour changing Submersible Lights can also be added to create spectacular water and light shows in both residential and commercial installations. Our larger range of Pondless Fountain Kits incorporate the new Aquarius Eco pump, offering the same stunning water effects but without the safety concern or maintenance requirements of an open pond. 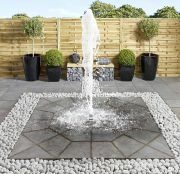 If you searching for a water feature that delivers and impressive impact or a rill, cascade or waterfall, Contact our friendly team at Water Garden Ltd for expert advice.